It is difficult to believe that whoever the US puts up will be able to live with Cuba’s Yobany Veitia (49-kilogram bronze medalist at the last world championship), Lazaro Alvarez (60 kg, two-time world champion and Olympic bronze), Yasniel Toledo (64-kg Olympic bronze and two-time world silver medalist), Roniel Iglesias (69kg, Olympic and world champion), Julio Cesar La Cruz (81kg, two-time world champion) and Erislandy Savon (91kg). The least experiences Cuban pugilists who the US team simply have to beat include Marcos Forestal (56kg) Ramon Luis (75kg), Gerardo Cervantes (52kg) and Yoandri Toirac (91kg). At the group stage the Domadores dominated, topping with ease the so called Group of Death while the US Knockouts struggled to even make it to the quarter finals. If the Cuban team have any weaknesses it is in a possible lack of depth to their first string fighters and a lack of close matches within this particular boxing format over the course of the season. One possible advantage the US will have is an intimate knowledge of the Cuban boxers given that their technical director is none other than Pedro Roque, considered one of the best trainers in the history of Cuban boxing, where he worked over several decades. In fact, for over 20 years, Roque was the head trainer for young Cuban boxers and coached such Cuban amateur and professional boxing luminaries as Joel Casamayor, Guillermo Ridondeaux, Ariel Hernandez, Hector Vinent and Mario Kindelan. In 2008, the International Boxing Association named him best trainer in the world. 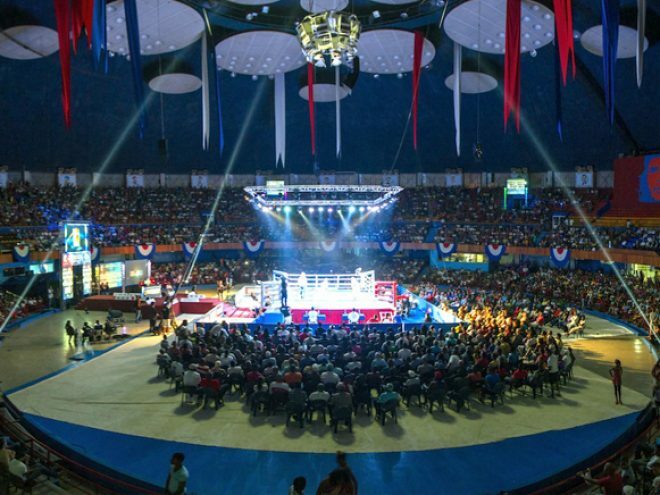 Following a request from the Florida State Athletic Commission to clarify the WSB boxers’ eligibility the first leg has been postponed by two weeks which means that the Cuban leg (meant to the return) will now be held first on Friday April 4 at Havana’s Ciudad Deportiva, where a full house is to be expected and all star Cuban entertainment likely (Los Van Van are rumored). It seems unclear where the return leg in the US will be — it was scheduled for the United Airlines Arena in Miami but now may move up the North-east (possibly due to political reasons). Where it is the bigger question will be whether there will be anything left to play for should the Domadores clean up on their home turf. April 2014 This article formed part of the April 2014 issue of What’s On Havana The definitive monthly travel & culture guide to Havana Download our current issue of What’s On Havana, your definitive travel, culture and entertainment guide for all things happening in Havana, Cuba’s bustling and enigmatic capital city. We include features from around Cuba written by the best international travel writers covering Cuba. Our monthly online digital magazine is also available in Spanish and French.